Bias in Gaming: Defaults and False Choice. Legend of Zelda has always had some interesting design choices; from its gameplay, to its level design, to its enemy creation and how it chose to inform the player of how to progress. Oversimplifying its weapons to make sure that they are intuitive to use and easily instinctual in recognizing when to use it. Enemies with only a single mechanic to perform makes them easy to deduce means of dispatching them; and the difficulty comes when mixing placement with variety with terrain forcing you to take into account more variables and manage more moving parts. It shows that they put at least some attention to how they create the experience in their games. That doesn’t mean that the Legend of Zelda is a perfect fleet and even its best ships have a few holes in them. The one that comes up time and time again is how they handle dialog. You hit “next” and you scream and storm away from the TV, incredulous to wasting your time for twice the length. A game actively keeping you away from the action by forcing you, the player, to slow down and pay attention. Why would the cursor be set to “No”? Take out battery. Turn on phone. Phone starts restarting. Google symptoms. Fiddle with phone settings. Phone starts restarting. Factory Reset Phone. Phone looks fine. Start setting up phone again. Download essential apps. Download non-essential apps. Download games. Load up game to restore data. It’s at this point where one of two things can happen. You can either get your data back easily, or you can spend the next 10 minutes with your eyes engulfed in ever deeper shades of red. The world and everything that resides within it has its own pace. Some things start and stop with regularity, others just move in their own direction at their own speed till the end of time. And as you play a game, you develop your own pacing. You might want to take your time for every platform that you need to jump from or corner that you need to turn and take in the risks to make sure there aren’t any surprises that you’ll recklessly run into, or you might dive in Action Hank headfirst into every situation tumbling and reacting to anything that’s in your way because you haven’t been punished enough for that recklessness. It’s up to the developers to teach you what the pacing of the world is and manipulate the player into adjusting their playstyle to match the pacing that is required to be successful in that world. There isn’t an exact speed that the player much hit, but there are limits between the cautiousness and haste that a player needs to be between to play effectively in the gameworld. 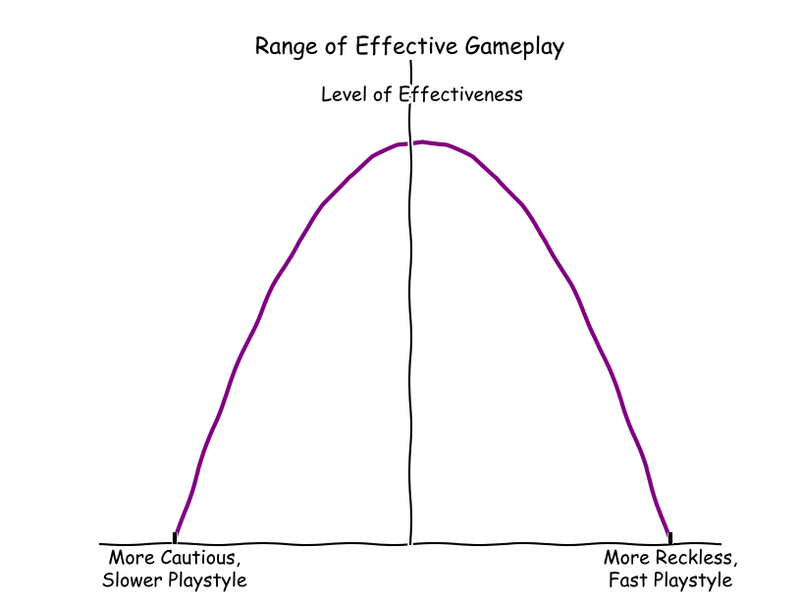 Visually, this is considered the playstyle-curve to see the relationship between different playstyle how effective those playstyles can exist within the game. 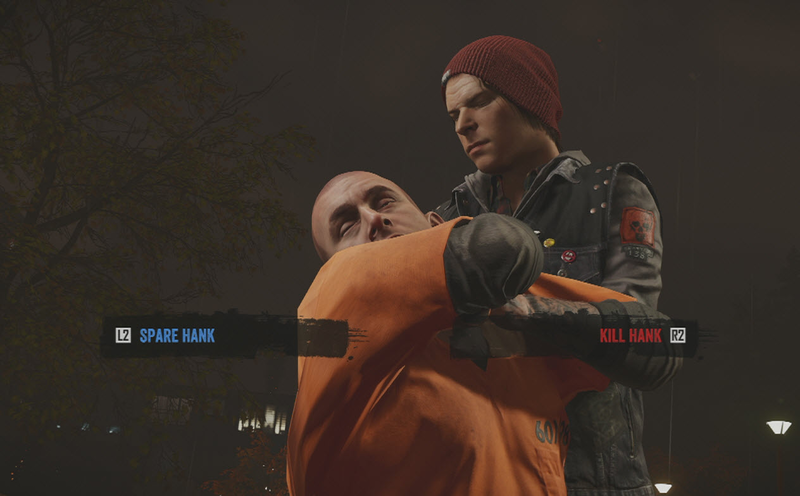 When a playstyle fits within the boundaries that of the game’s pacing, then a player is less likely to feel like the game is too slow because they won’t be able to take their time to check every nook and cranny for the inevitable damage that they will take and they won’t feel that the game is too easy because they can’t just run through and have their way with the game without consequence. Every game, with all its enemies and doors and health bars and platforms, has a set pace. A pace in how they move, when they move, how fast they move. And that pace, the pace of everything on screen, dictates the pace that the player can plan out their moves and it dictates the window that the player has to perform their plan. But when the pace of everything on the screen is rhythmic, meaning that the pacing matches a particular interval, is matched by the rhythm of the player to plan and perform within the window that the game gives then a sort of harmonic resonance can develop between the player and the game, and that can be a wonderful feeling to have.